are looking forward to celebrating the birth of our Lord and Savior! God is love! He loved us so much that he gave us a Gift - His only Son Jesus to die on the cross for our sins. He wanted to make it possible for us to have a relationship with Him through simple repentance and faith. Salvation is a free gift! But, as we know, it cost God everything! We pray that this season you will rejoice in our Savior and look for His second coming each day of the New Year! 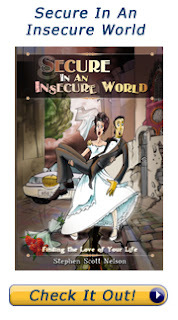 Secure In An Insecure World published in Russian! This is the cover. A Ukrainian friend who lives in London wrote, “Steve, just wanted to say how proud am I to know you and to have an opportunity in the past to work with you. Your book is amazing opportunity not just to improve on one's marriage but also to be re-assured in Christ love. And, those Christian who failed in the past (btw this subject is hardly raised) to be re-engaged with Christ and even more believe in his Power and Word and for others get to know the Lord and be saved. I live in the West London, and how little people know God in this part of the world, I mean West Europe. I think I had such a privilege to be born in Kiev and to get to know Christ and saved.” Christmas Gift Idea: Order a copy of Secure In An Insecure World (in English of course) for your friends! It could change their lives! Go to www.gcmnelson.com to order today and receive it before Christmas! Thank you to those who have faithfully supported us over the years! It means so much to us, and even more to the Lord! Church Conference in Odessa Timmy Powers and I took 14 men from Kiev down to Odessa. We taught a conference on the church to several small groups of believers. They recently began to function under Christ’s headship (leadership), to meet in homes, and encourage each member to participate. A group of 15 believers also came from Moldova to join us. Timmy, myself, Stas from Moldova, and Maxim Nickolaev (pictured at right), each taught. It was a rich time studying God’s word together and enjoying fellowship with like-minded men and women. Thank you for your prayers. Please continue to pray for them! They are charting new waters with God. The Ukrainian leaders we mentor to be humble, teachable and walk with Jesus daily. The Awaken Conference Jan. 2-6. Steve will be speaking several times. Grace and Merry are coming to Kiev for Christmas & we will attend Awaken together. Pray for God to make this short time of growing in our love for each other and Jesus. God to powerfully use Steve’s book to save unbelievers & transform believers.